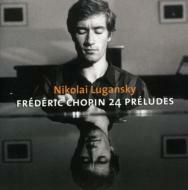 Chopin:24 Preludes For Piano, Artist: Nikolai Lugansky / This thoughtful set of performances was made in 2001 and has received a good quality recorded sound with a realistic recorded balance. The program is unusually interesting incorporating a selection of nocturnes and ballades to complement the set of preludes. Lugansky is not a pianist that everyone warms to as frequently he delivers interpretations that are less 'showy' than others provide and which might be expected. Instead he delivers performances that are considered and often have a darker side to them beyond normal expectations. Consequently his performances of the Rachmaninov concertos were not liked by the reviewer in the Gramophone for example (Bryce Morrison) but became referred to as the benchmark reference discs fro the reviewer/s in the BBC magazine, the one finding his performances cool and detached and the other finding them grippingly committed.